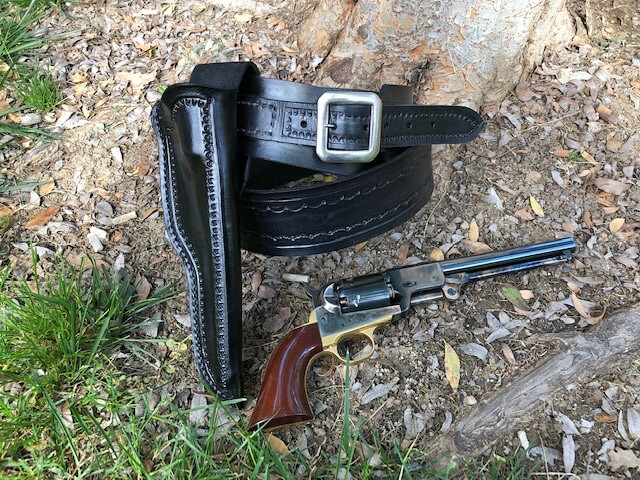 I decided that my Uberti Leech & Rigdon needed it's own rig. So I started it last week. 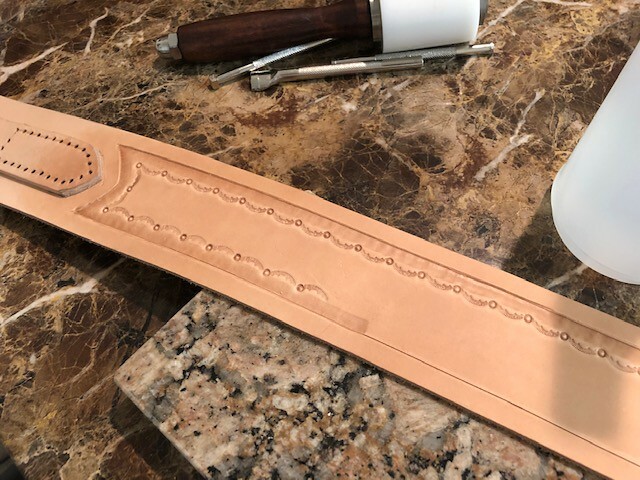 I'm no leathersmith, but I'm teaching myself and having a lot of fun doing it. 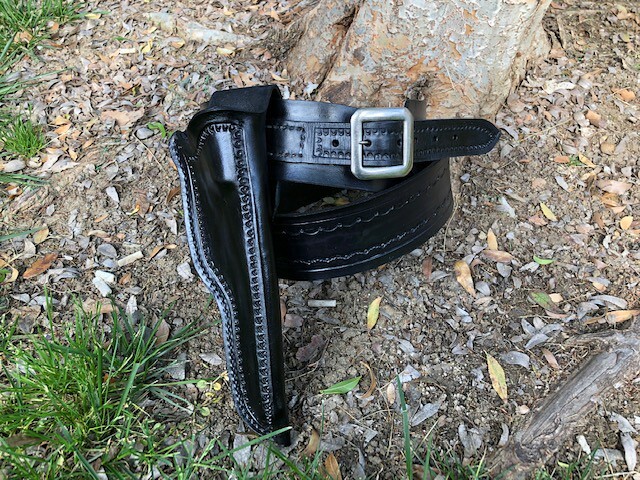 Here's the finished belt. I wanted it to be black this time. It just seems fitting for an Army revolver to be in a black holster. Speaking of holster, I'm starting on it today. Pictures of the finished rig coming shortly. Nice work! Can't wait to see the holster. I'm working on a Hand Of God holster right now and a couple for a Cobra 357 derringer. Unfortunately, I don't get to keep them....but learning a bunch about the process. Just enjoying the hell out of it. Thanks Miguel! It's really fun to create something and then put it to use. Or see someone else put your work to use. I'm really enjoying the leatherwork too. Looks terrific! You do some nice work! Cool. An Army needs a rig, a good one. Hi Miguel -- I had to look up Hand of God holster. Still not clear what characteristics go into one. Does that mean it’s lined with soft leather? What makes a holster one of those? 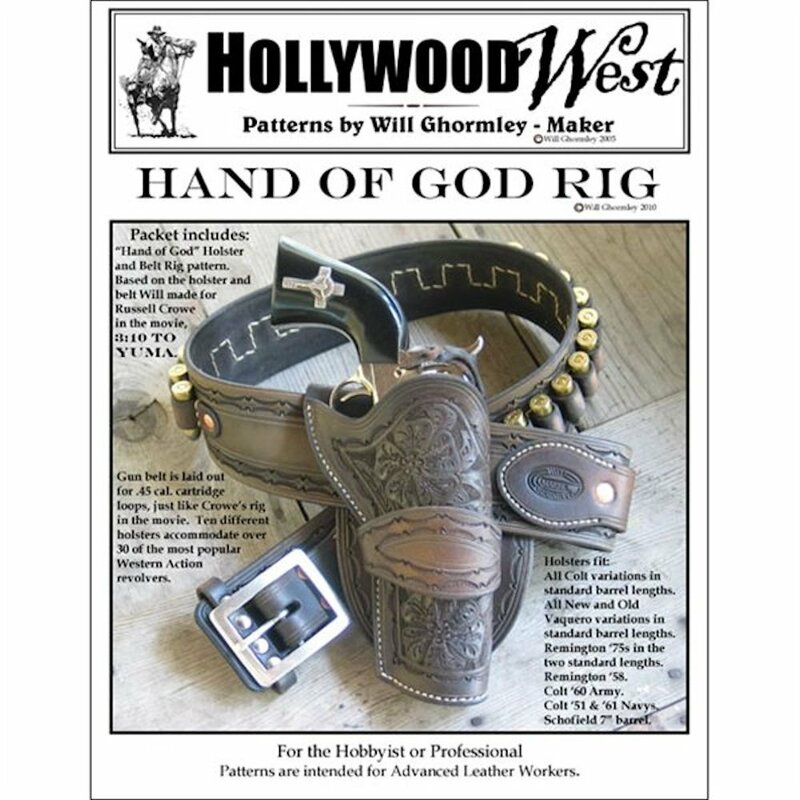 Hi G Dog, the "Hand of God" holster is just a pattern designed by a Hollywood leather guy named Will Ghormley. 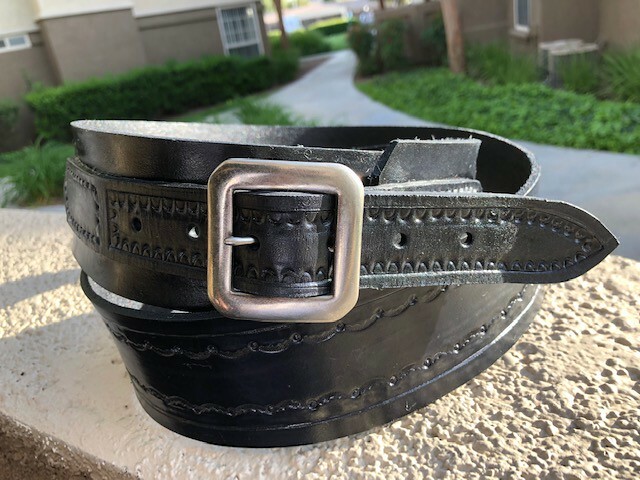 It was worn by the character played by Russel Crow in the movie 3:10 to Yuma. Thanks Mike! It's a nice pattern pack he has. Pretty much covers them all from 1851's to 1911's. But I had fun playing with the tooling....and learning. Hi Mick, I guess I should start coming up with cool names for my rigs too. You just need a trip to Hollywood! The Smoke Shop sells the H.O.G. revolver as fast as they get them in....they usually last no more than 48 hours. That's why I'm doing the holster for them. Might as well try to add a few $$$ to the sale. Contention....the town the 3:10 is leaving from in the movie was about 8 miles from Tombstone....so it fits perfectly for them. That's the only reason for doing it. The town was unfortunately bulldozed by the land owner to get rid of squatters in the 1930's......and it's now government property with limited access.....but I have been there. It shows up in a search of google maps so it's pretty easy to find....but a LONG walk to get in. I've spent years wandering the southern AZ desert and it's amazing what you run into. As you can tell by the title change, I decided to go a different route. The Army is crying out for a military style flap holster. So that's what I'm going to make for it. 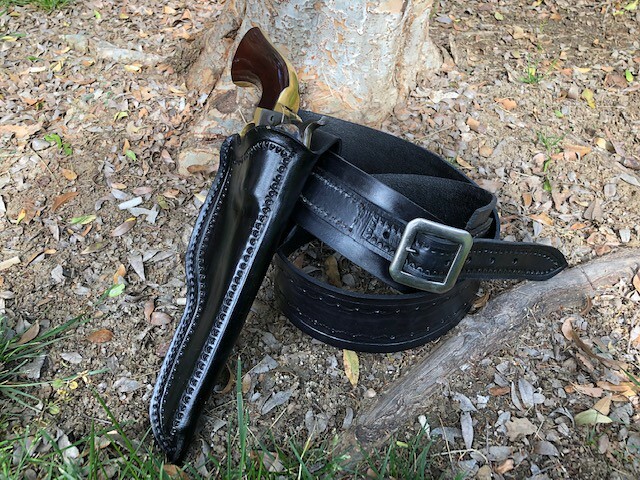 I decided to give this belt and holster to my L&R. It's such a beautiful gun and a joy to shoot, that it deserves it's own rig. So here's the finished product. Like I said, I'm no leathersmith but I'm pretty pleased with it. Next one, I'm going to tackle a lining in. Hi Dave, that rig looks pretty darn nice! Nice work. As Fernando Lamas once said "It is better to look good than to feel good". That rig will let you both look and feel good. Dave, pretty sure any member on this forum would be proud to own that rig. I know I would. You did an awesome job IMHO. Thank you gentlemen. I appreciate it.